You can cut these steak fry size or quarter small sweet potatoes. Since my husband ensures that I have every kitchen gadget known to man, I have a commercial strength french fry cutter. Cutting sweet potatoes down to regular french fry size is very tasty. The large cut is perfect. When you get it just right, they are crunchy on the outside and soft on the inside. Yummy! Preheat oven to 400° degrees F (200° degrees C). In a large bowl, mix olive oil and paprika. Add potato sticks, and stir by hand to coat. Place on the prepared baking sheet. Bake 40 minutes in the preheated oven. Sprinkle with some sea salt before serving. I had some in a restaurant a few weeks ago that were deep fried. I’m thinking about giving that a try -they were super crispy outside and soft and yummy inside. 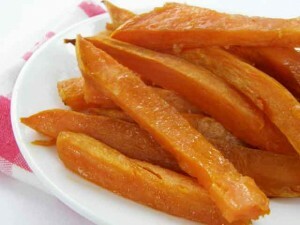 I have a TON of sweet potatoes from our CSA, and we love them as fries. Today’s my “putting up” day… How well do these freeze and what might be the re-baking instructions? They freeze great. You might want to put them in some lemon water just to keep them from browning. Don’t bake them until they’re all the way done – bake them until they’re nearly done. Pull them out of the oven, let them cool, then bag to freeze. No need to thaw before baking again. To re-bake, heat oven to 400 degrees and bake until done. The time would depend on the thickness of the fries, but I’d guess about 20 minutes – maybe 10 minutes, then turn them over, and 10 minutes more.